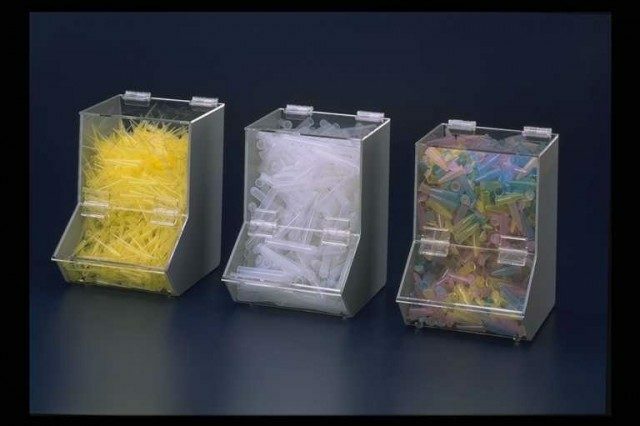 BioStor storage bins allow convenient, one-handed access to bulk pipet tips, microcentrifuge tubes, test tubes, caps, vials, and other small laboratory disposables, while protecting them from dust or other contaminants. Items are easily loaded through large hinged top cover and dispensed by lifting hinged lower cover. Handy size allows ample room for most products. Transparent acrylic face panel provides quick visual identification of parts.